Canada's aerospace manufacturing and maintenance, repair and overhaul (MRO) sectors have been on a strong growth trajectorytt and are the source of many highly-skilled and well-paying jobs. According to a labour market report by the Canadian Council for Aviation and Aerospace (CCAA), 83 per cent of Canadian aviation and aerospace companies expect to grow over the next five years. Another driver for hiring will be retirements. As the Canadian workforce ages, demand for younger workers – and workers with skills to apply to new and emerging technologies in aviation – is expected to grow rapidly. The highest demand over the next few years appears to be for AMEs, aircraft mechanics and aircraft inspectors. Rapidly changing advancements in software development, avionics and data management (particularly on the unmanned systems arena) also present opportunities. Here are some top eductional institutions to drive next gen leaders. British Columbia Institute of Technology | Vancouver, B.C. The British Columbia Institute of Technology (BCIT) School of Transportation is a North American leader in transport training and producing high-quality, job-ready graduates in demand by the aerospace sector. The School of Transportation delivers accredited and globally recognized programs tailored to meet the human capital needs of the transport industry. The school’s aerospace facility is the largest provider of skilled graduates to the aviation industry in British Columbia, and offers accredited programs that prepare graduates for careers as Aircraft Maintenance Engineers (avionics and maintenance), and Gas Turbine/Jet Engine Technicians. The 285,000 foot Aerospace Technology Campus is conveniently located at the Vancouver International Airport and features a dramatic 40,000 square foot hangar at the centre for BCIT’s fleet of light piston, turboprop, corporate and jet transport aircraft, and light and medium helicopters. BCIT’s new Aviation Maintenance Technician – Avionics program consists of 68 weeks of full-time studies. Approximately 50 per cent of the day is spent on theory in a classroom setting, followed by hands-on practical training in the shops and hangar located at the Aerospace Technology Campus. 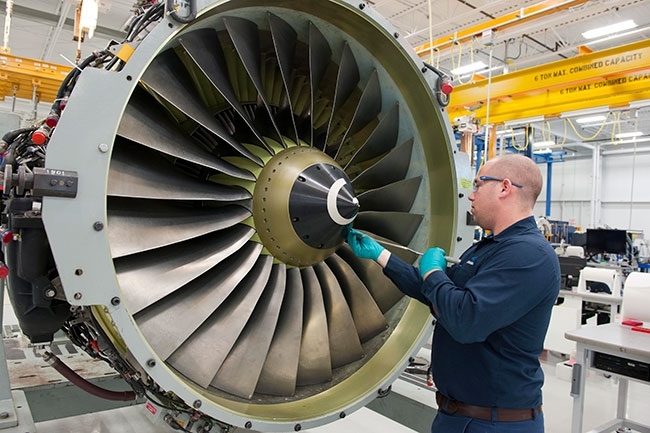 The Aircraft Gas Turbine Technician program consists of 38 weeks of full-time studies, and includes access to a wide variety of gas turbine engines and extensive use of specialized engine tooling. Northern Lights College | Dawson Creek, B.C. Northern Lights College (NLC) opened in 1975. It is known as B.C.’s Energy College, serving northern British Columbia in an area covering more than 324,000 square kilometres. NLC’s Aerospace Centre of Excellence opened in 1981, at the college’s Dawson Creek Campus. Aspiring students and current aircraft maintenance engineers receive hands-on training in a 26,000 square foot hangar that houses 13 aircraft, including a Robinson R44, Airbus AS350D and Bell 205 and 206 helicopters, a Cessna 180, Beechcraft King Air, Piper Aztec and British Aerospace Jetstream 31, turboprop airliner. NLC offers two types of Aircraft Maintenance Engineer training: Basic Training and Type Training. The 15-month Basic Training program is designed to train individuals wanting to work in the aerospace industry. SAIT Polytechnic | Calgary, Alta. The Southern Alberta Institute of Technology (SAIT) Polytechnic is a member of Polytechnics Canada, a national alliance of leading research-intensive colleges and institutes of technology. SAIT’s School of Transportation provides hands-on, practical education for the aviation, heavy equipment and rail sectors. The school offers full-time training in aircraft maintenance engineering, aircraft structures and avionics technology. All programs are taught at the state-of-the-art Art Smith Aero Centre for Training and Technology, located at the Calgary Airport. The two-year Aircraft Maintenance Engineers Technology program trains an aircraft maintenance technician to be responsible for the service and repair of all types of helicopters and airplanes. Aircraft Structures Technician is a one-year program that teaches the modification and repair of aircraft, helicopters and their structural components. Avionics Technology is a two-year program where students learn to repair and maintain the electrical and electronic systems in all types of airplanes and helicopters. The Saskatchewan Indian Institute of Technologies | Saskatoon, Sask. The Saskatchewan Indian Institute of Technologies (SIIT) was created in response to the need for quality, post-secondary education for First Nations people. The Saskatchewan Aviation Learning Centre at Saskatoon’s Diefenbaker International Airport is a joint effort of SIIT, the Government of Canada, Province of Saskatchewan and the Saskatoon Airport Authority. The SIIT Aircraft Maintenance Engineer program is open to First Nation and non-First Nation students and delivers the knowledge and skills required for eligibility to apply as an apprentice in the aircraft maintenance industry. Graduates are credited with 18 months toward the current four-year industry requirement to obtain a licence. Red River College | Winnipeg, Man. Red River College (RRC) offers training in all aspects of the aviation and aerospace sectors. RRC’s Aircraft Maintenance Engineer program is designed to develop the knowledge and skills in maintenance of both large and small airplanes and helicopters. Aircraft Engineer Maintenance uses a combination of classroom and practical training on a fleet of fixed- and rotary-wing aircraft to provide the necessary foundation for entry-level positions in the aircraft maintenance industry. The diploma program is designed to develop the knowledge and skills in maintenance of both large and small airplanes and helicopters. Time is split between the study of aircraft maintenance theory and practical projects. Upon graduation, students receive an experience credit of one month for every 100 hours of training and will have completed all the necessary exams with the exception of the Transport Canada administered Canadian Aviation Regulations (CARs) exam. This program has been accredited by the Canadian Forces for their Non-Commissioned Member Subsidized Education Plan. RDC also offers programs for careers as an Aircraft Structures Technician, Aircraft Gas Turbine Engine Repair and Overhaul Technician. Canadore College | North Bay, Ont. Canadore has been a leader in aviation training for more than 40 years. The School of Aviation is a dedicated aviation training facility with approximately 30 employees assigned to the Aircraft Maintenance, Avionics Maintenance and Aircraft Structural Repair programs. Courses are delivered at the college’s Aviation Campus at Jack Garland Airport. The 87,000 square foot campus includes 17,000 square feet of prime training space and is filled to capacity with fixed- and rotary-wing aircraft for students to work hands-on. A new Advanced Composites, Fabrication, Repair and Test Centre is a recent addition to the campus and supports innovative technologies, applied research, materials testing opportunities and customized training programs. The college offers three basic training programs: the Aircraft Maintenance (AMT), Avionics Maintenance (AVN) and Structural Repair (ASR) programs. Centennial College | Toronto, Ont. Centennial College’s School of Transportation is Canada’s transport training hub. The faculty are among the most highly-skilled in the industry and training equipment is state-of-the-art, including a fully equipped hangar for aerospace and avionics students. Programs are supported and reviewed by industry representatives to ensure they are of the highest quality. Aircraft Maintenance and Avionics Maintenance are the two Aviation Technician programs offered within the school. The Aviation Technician – Aircraft Maintenance program is for students who are more interested in the airplane than the trip. It provides the opportunity to master mechanical, electrical, electronic and other science skills related to aircraft maintenance. The Aviation Technician – Avionics Maintenance program provides students with the knowledge and skills to launch a career as an aircraft maintenance technician in avionics, which covers a wide-range of the aviation and aerospace sectors that work together to keep aircraft safe and airworthy. Avionics Maintenance courses are designed to teach students how to perform tasks and activities associated with the maintenance and repair of aircraft communications, navigation and data systems and inspection and troubleshooting of basic electronics circuits to sophisticated avionics systems found in modern aircraft. Centennial College’s Ashontbee Campus’ airplane hangar provides a learning environment that conforms to industry standards. Students learn about routine maintenance, servicing, inspection, diagnostics and repair, as well as performing flight-line duties.